Lloyds No 1 (Wetherspoons) bar on the High Street. 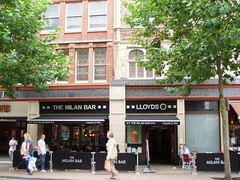 According to the Wetherspoons website, the Milan Bar first opened on 9 December 2002. Last edited 2019-01-24 14:59:08 (version 28; diff). List all versions. Page last edited 2019-01-24 14:59:08 (version 28).